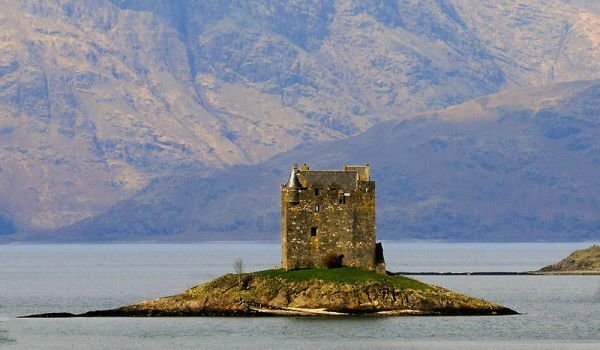 Stalker Castle is a lonely little island, which is dependent on tides in Loch Laich, a bay of Loch Linnhe. Castle Stalker is located 25 miles northwest of Oban, halfway between Oban and Glen Coe. The name of the castle comes from the Celtic word stalcaire, which translates as a hunter or falconer. Situated attractively on the small island amidst the waters of the lake, the dramatic backdrop of the Scottish mountains Stalker is loved for many natural miniature postage stamps, calendars and postcards. This castle is a fully authentic medieval fortress, which has managed to keep up nowadays in a remarkable good condition. It is believed that before the medieval Stalker Castle on the island was a fortified building of the MacDougalls clan, which at that time were Lords of Lorn. Perhaps Stalker was built in 1320. In 1328 McDougall gave the land in the area, including Stalker Castle to the Stewarts clan. It is assumed that roughly in its present form Stalker was built in 1446 by Sir John Stewart. In the following centuries the palace, which consists of a square structure built of towers continuously passes into the hands of one clan from another and vice versa. Stalker Castle has even played in gambling bets. In the 18th century Stalker was in possession of such Campbell. At that time it was turned into a military post. In 1800 the family built a palace to a small house which exists today. Then Stalker was mainly used as a warehouse. In 1840 the roof of the palace falls and probably to avoid taxes the fort was abandoned. In 1908 the heir to the Campbell family saved their last possession of the total decay, and tried to restore it. Still Stalker is part of the Stewart family ownership. For most of the year the palace is closed for public visits, but there is a timetable which allows Stalker to be visited by guests, but only at low tide.